Sam Kraft (‘18) was named IIAC Performer of the Week for Jan. 1-8. 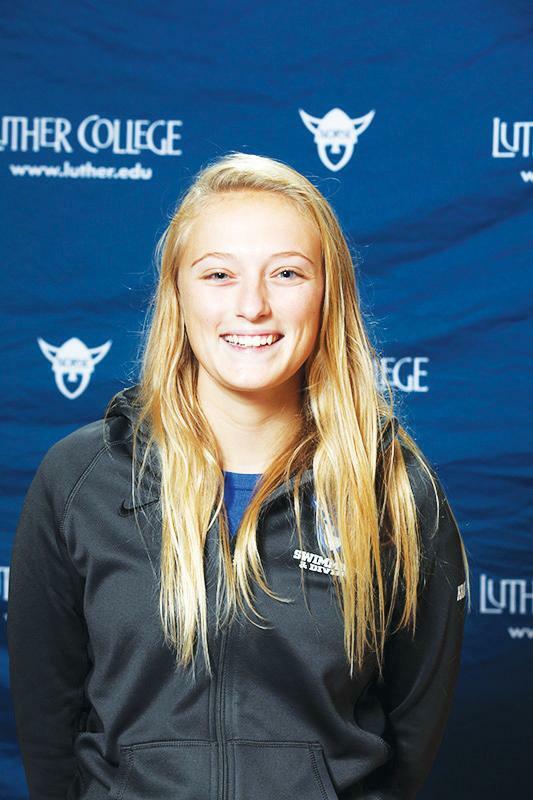 That week, Kraft helped lead Luther to its first Iowa Conference victory in a competition against Loras on Jan. 7. Kraft had two first-place finishes and a third-place finish. In the 1,000m freestyle, Kraft finished with a time of 11:20.00, 21 seconds ahead of the next competitor. She also swam the second leg of Luther’s winning 200m freestyle relay, helping her team win with a time of 1:48.71. Kraft finished third in the 100m fly with a time of 1:11.34. What did it mean to you to be named IIAC Performer of the Week? It was an accomplishment knowing that all my hard work paid off. After all my hard work and winning an event that I haven’t won very often, it was nice to see. What are your goals for swimming? This past weekend I broke the record for the mile, so that was really nice. It kind of showed that I was able to make sure that I could achieve my goals. When did you start swimming, and why did you start? I started swimming when I was seven. I didn’t really like the water, so I started doing some swim lessons. Then I started to like the water, so I joined the swim club and have been swimming ever since. Who are some athletes that you look up to? I know a girl who swims at the University of Iowa that I swam with in high school. She has made the Olympic Trials multiple times, and that has been nice. I definitely look up to her. Sam Kraft (‘18) swims at Loras. What is your favorite part of competing? My favorite part of competing would be the competition along with my teammates. I really like cheering on my teammates and having them cheer me on also. We do this little “get ‘em cheetah” cheer before races. That is really nice because it gets me pumped up. What has been your favorite memory swimming here at Luther? At our Conference meet, the 800m freestyle relay, when we won that my sophomore year it was really fun. That is my favorite memory.